The purpose of commercial real estate tax credits is to encourage the preservation of historic buildings through incentives to support rehabilitation of historic and older buildings. Since the inception of the Federal Rehabilitation Tax Credit, Louisiana has been a leader in certified tax credit projects, generating over $2 billion in private reinvestment in Louisiana communities. The State Commercial Tax Credit has leveraged more than $350 million in private reinvestment in Louisiana Downtown Development Districts and Cultural Districts. A tax credit is a direct, dollar for dollar, reduction in the amount of money a taxpayer must pay in taxes for a given year. For example, if a taxpayer owes $5,000 in taxes to the Internal Revenue Service, but has a $3,000 credit, he only pays $2,000. Thus he pockets the $3,000 he would otherwise have to pay in taxes. A credit is much better than a deduction which merely reduces a taxpayer’s income and puts him in a lower tax bracket. The Federal Rehabilitation Tax Credit is for 20% of the costs of rehabilitation expenses for an income producing building. The credit is available for income-producing properties that are contributing elements to a National Register Historic District, or individually listed on the National Historic Register. All properties must be certified by the National Park Service. To qualify, the rehabilitation work must exceed the adjusted basis for the building (either the purchase price minus the value of the land, or the current depreciated value). The building must be a contributing element to a Downtown Development District (DDD) or a Cultural District. The building must be used for an income-producing purpose. Eligible expenses must exceed $10,000. This credit may be used in addition to the Federal Historic Rehabilitation tax credits, provided that the most stringent program requirements are met. It may also be combined with the State Residential Tax Credit Program if the building is mixed-use. Homeowners may qualify for a 25% tax credit (50% for vacant and blighted properties) against their individual state income taxes when they rehabilitate their historic home. The property must be the owner’s primary residence. 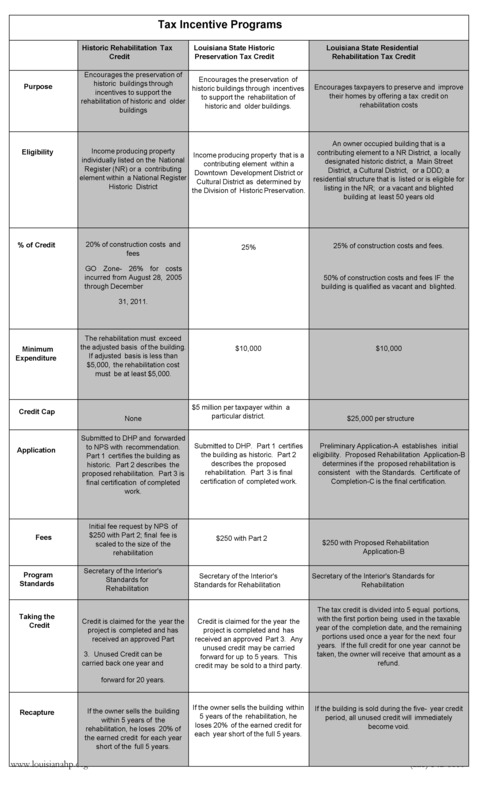 There is a $25,000 credit cap per building, with one credit allowed per building. Rehabilitation costs must exceed $10,000. Can I Get A Tax Credit After Renovation? The credit is not automatically available to any owner of an historic building. An application must be filed with DHP. Although not recommended, applications can be accepted after commencement of rehabilitation work. However, the Part 1 or Part A application must be submitted prior to the building’s placement in service. It is best for an owner not to start construction until after the Part 2 application has been approved. If work is begun without an approved application, the owner proceeds at his own risk. Approval of a rehabilitation project by any other group, organization, or governmental entity does not insure approval by DHP or NPS. All applicants are advised to consult with their tax attorneys and/or certified public accountants in developing projects to determine if the credit will work for you.